Obituary for Marcia Elaine Smit | Langeland Family Funeral Homes, Inc. Passed away peacefully in her home on Thursday evening, April 26, 2018. Marcia was born November 11, 1941 in Kalamazoo the daughter of the late Omar and Irene (Selegy) Skinner and had been a lifelong resident in the Kalamazoo and Portage areas. In August of 1960, she was united in marriage to Norman John Smit. Although divorced in1990 they remained friends until he preceded her on death in 2012. 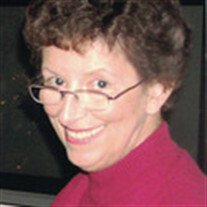 Prior to her retirement, Marcia was employed for 22 years with the Upjohn Company and Pharmacia. She loved her family, especially her grandchildren, her lifelong friend Marsha (Fox) VanDyke, crocheting, sewing, cross-stitch, and her cats. Marcia is survived by her daughters, Kathryn (David) Westman, Laurie (Dan) Duncan; 4 grandchildren, Jessica and Sarah Westman, Trayton and Kaitlyn Duncan; and a sister, Cynthia (Tom) Johnson. She lived her life quietly and simple. As in life so did she pass this way. She will be greatly missed. There will be no services or visitation. A private family interment will be held at a later date in Schoolcraft Cemetery. Memorials may be directed to the DAV.